Is it strange to crave pumpkin pie post-holiday season? Well, I did not have any so now I'm fighting this huge craving for creamy spicy pumpkin pie. Actually, it's the pie filling that I dream about so I decided to make a healthy version that can curb my craving without assaulting my waistline. 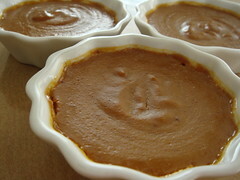 The result is my butternut squash custard. This custard has all the creaminess you come to expect from a good pumpkin pie but barely any of the fat and empty calories. Butternut squash is an excellent source of vitamin A so you can even say this dessert is good for you! Preheat oven to 400F. Split the butternut squash in half, length-wise. Scoop out the seeds and lightly oil the cut-side of the squash. Place the two halves on a 9x13 baking pan, cut-side down. Roast for about 45min until tender. Cool until you can handle the squash without burning yourself. Peel the squash and put all the flesh in a food processor or blender. Process the butternut squash until it becomes a creamy puree. Put the puree into a large mixing bowl. Preheat oven to 350F and place 24 shallow ceramic ramekin on a baking sheet. In a small mixing bowl, stir together soymilk and maple syrup. In another small mixing bowl, whisk together eggs, spices, and a large spoonful of squash puree until there is no lumps. Whisk the egg mixture into the squash puree. Finally, stir in the soymilk mixture until you have a smooth batter. Divide the batter evenly among the ramekins. Bake for about 30min until custard is set. Enjoy warm or at room temperature. If you want to get fancy, you can caramelize some sugar on top of the custard so you have butternut squash creme brulee. 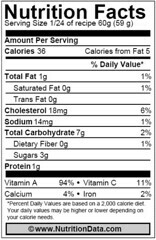 Since I started using FitDay to keep track of my daily food intake, I've become more aware of eating a greater variety of food in order to be more nutritionally balanced. Eating whole food is obviously better than processed food so it was a good motivation for me to get back into the kitchen at last. We are now knee deep in winter and local produce leans heavily toward all kinds of root vegetables and winter squashes. Not a bad thing at all if you, like me, loves sweet potato (especially the Japanese variety used to make yaki imo, yum! ), pumpkin, butternut squash, daikon, and kabocha! The easiest way to cook these colourful vegetable is to roast them. As long as I am not short on time, all I need to do is to cut them up and let them take care of themselves in the oven. Roasting really concentrates the flavour. With the high sugar content of these vegetable, the deep caramelized flavour after roasting is the number one reason why I love this cooking method. For dinner tonight, I split an acorn squash in half, rubbed it with a bit of olive oil, and roasted it cut-side down. Even without any seasoning (who needs salt anyway), the squash was delicious. The golden hue of the flesh was such a beautiful contrast with the dark green edible skin. Besides, acorn squash is the perfect size for a dinner for one! While the acorn squash was roasting, I didn't want to waste a hot oven. So I grabbed everything in the kitchen that I could roast. The result? A dish of carrots and shallots glazed with balsamic vinegar. Who would have thought that a dish I threw together on a whim would turn out so good? While it was cooking, my whole house smelled delicious. I can't wait to visit a farmer's market tomorrow and see what kind of treasure I bring back home. In my banana baking frenzy yesterday, I also made two neat little layer cakes filled with Meyer lemon curd and frosted with white chocolate cream cheese buttercream. The cake itself is of course my favourite recipe Cordon Rose Banana Cake, all from the trusty The Cake Bible by Rose Levy Beranbaum. This is probably one of my most used books. This banana cake recipe has a fine crumb and the flavour was perked up by some lemon zest. The Meyer lemon curd is less tart than regular lemon curd and it picked up the subtle lemon taste from the cake without overwhelming the banana flavour. The white chocolate cream cheese buttercream is rich and tangy to offset all that fruitiness. This is a light and fresh combination that goes well after a heavy meal. As you can see from the picture, I did a pretty sloppy job of masking the cake. This is certainly one of those skills that requires frequent practice! As a shortcut to ensure more or less uniform thickness of buttercream all around, I piped the buttercream onto the cake using a large plain tip. This is too slow if you work in a bakery but it's a good trick for home bakers. I brought one of the cakes to a party last night and it was hastily decorated with chopped walnuts on the side and a ring of walnut halves on the cake. The other cake had a chance to properly rest in the refridgerator overnight so the buttercream firmed up by the time I decorated it this morning. I remembered a bunch of cake stencils that I bought in Hong Kong and it was the perfect opportunity to try them out. 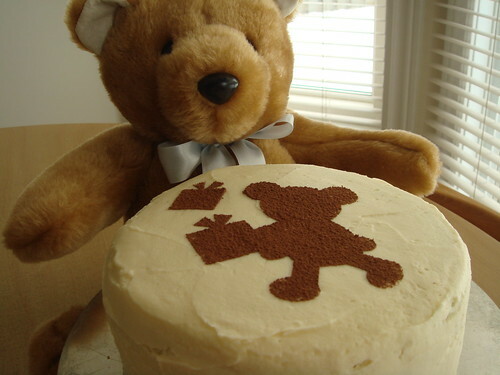 Being susceptible to all things cute, of course I chose to stencil a teddy bear onto the cream-coloured buttercream. So absolutely adorable that Teddy wants a bite too! Happy New Year everyone and may 2009 bring you lots of sweetness everyday!